I used to fly a lot for business. I got to be very good at it, especially when I was lucky enough to fly first class (which is a wonderfully terrible waste of money). But my current job doesn’t require any travel. And I’m basically a homebody. So that means I don’t travel much at all anymore. So now when I take the occasional trip, the idiosyncrasies of travel seem more noticeable. 1. That there is now an additional fee to check your bag. So everyone has two carry-ons. Which no longer fit. So if you board the plane last, there’s no more room for carry-ons, and they check your bag for you. For free. Huh? 2. I read somewhere that efficiency studies have been done to get passengers aboard in the quickest, easiest way possible. The results of these studies must have been lost. The entire plane is Zone 4. I particularly like the Porch Potty, which comes in Standard or Premium with a scented fire hydrant and a hygienic sprinkler system. And there are mahogany crates and baby-gates, fountains, food dishes with timers, bird-watching videos, and many other accessories for the neglected pet. 4. 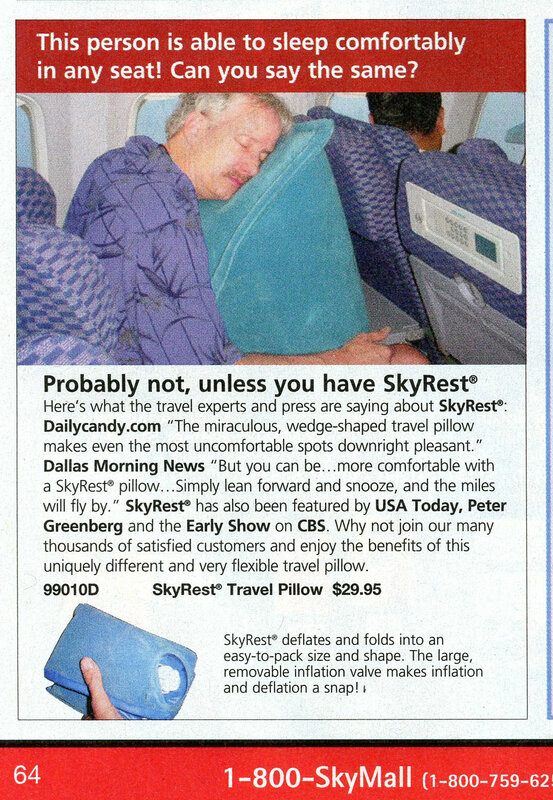 Air travelers have now begun to WEAR THEIR PILLOWS when they travel. The boarding gate looks like a whiplash convention. I didn’t see this guy, though. But I am sure it is just a matter of time. 5. Some instructions are unnecessary. 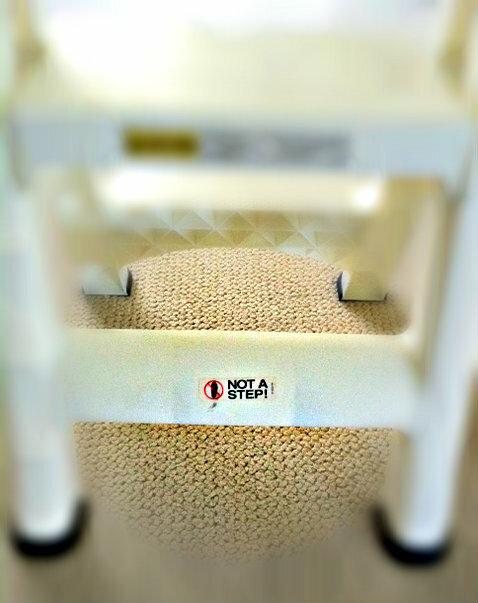 I have a step-stool at home that has a little warning on the non-step side. I can see where I may accidentally use the wrong side as I climb up to clean my light fixture. But I also noticed from my assigned seat (in Zone 4) that the “NOT A STEP!” sign also appears on the wing of the plane. 6. I am sure that some guy with a sick sense of humor cleans the plane between flights. This comedian must go around and shorten every seat belt as he straightens up. 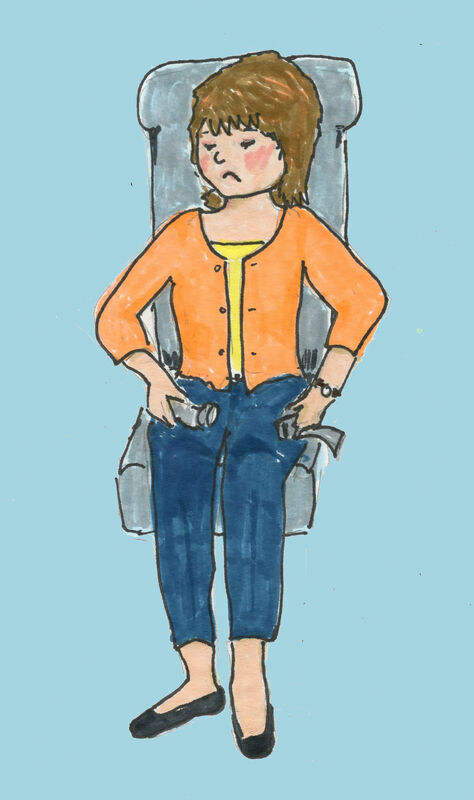 No matter where I sat on the many legs of my journey, I had to let out the seat belt about nine inches. Not funny. Well, I’d certainly like to toilet-train my cats. I haven’t traveled in awhile so I’m glad it’s become so streamlined. The stepping-on-the-wing thing to get aboard really slowed things down. I absolutely HATE zoned boarding. The algorithm is based on how much you pay for a seat – so people who paid full fare go on earlier than those of us who used Expedia. That means boarding takes forever while we wait for people in the forward aisles to haul their behemoth suitcases (because you have to pay to check) into the overheads. That’s the algorithm? By how much you pay? Well, I was certainly with the cheapskate boarding all the way. These are all reasons why I can no longer bear to fly. I’m planning to go to Europe, so I’m taking swimming lessons. Hey I HAVE a cat sitter video. I hate flying. Hate it. But maybe I should shop during each flight and make it a little less painful. Or drink more. Back in the good old days, I would need a drink to relax before boarding. Now that things are even worse — security, overbooked incredibly full flights, obscene carry on luggage, tons of screaming kids (always sitting next to me) and multiple delays, a drink just doesn’t do it. I have developed a list of airports that I will definitely not fly into to connect and ones that I like. In any case, I don’t fly unless I really want to go somewhere. I admire people who do quick weekend jaunts to different places. Maybe there are drugs that would help? We had family business to attend to, or I wouldn’t have gone. “Jaunt” and “Flying” do NOT go together. I just want to know if the toilet trained cats also flush the toilet. Otherwise, it’s not worth it. I would SO flush for them, if only they’d use the toilet. They can even use the fancy guest bathroom. I have been flying for 20 years, nearly every week. This year is the first I have been home more than I have flown in all those 20 years. There is a trick to it. I have seen that guy, have sat next to him in fact, him and many others. I have even written about a few of my all time favorites, I am sure over time I will write about more as they enter my halls of infamy. Most things simply don’t bother me anymore, at least not about flying. At my age, I don’t have such good results when I sleep on my face. Clearly it doesn’t bounce back quite like it used to. I was comparing flights the other day, and getting ready to hit “buy” on a cheap flight to New York when I noticed in the fine print that they charge $40 for a carry-on bag. For a carry-on! That ought to cut down on all the people stuffing their huge bags in the overhead bin. hahahaha I am with you on the seat belt!! And I’m so glad you pointed out the carry-on thing. The fact that they charge extra for luggage the way they do now is MADDENING! The one thing that I love when I watch movies or television is how much room they have on those planes, between the aisles and the between each row. The flight attendents look like they work in small hotel rooms. It just ain’t that way on a real plane. Hilarious diddy here. It does not make me want to get on a plane again one bit. Didn’t they step, and stand, on the wing during the miracle on the Hudson? After my experience with TSA wanding and frisking my cat, then charging him $1 less than my air fare to ride under my seat I gave up. 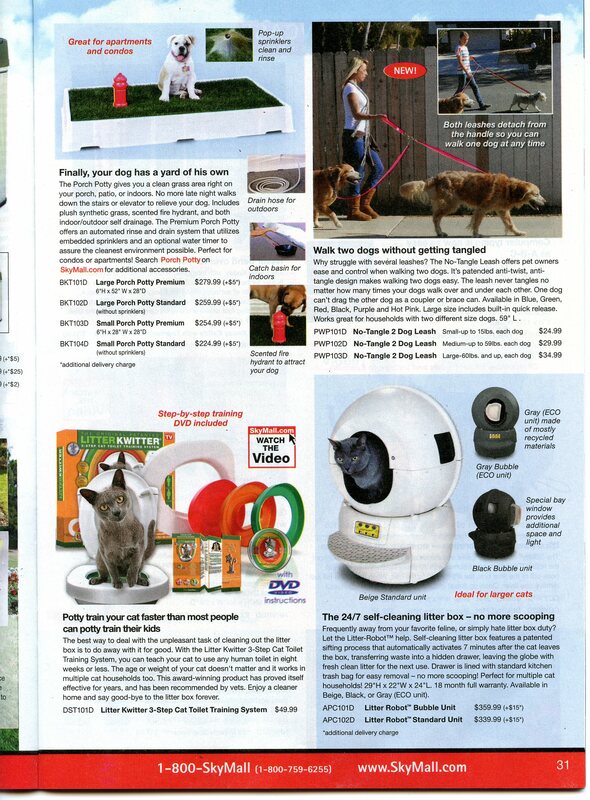 Anyway… love those Sky Mall items. Glad I drove on my last escape from town!